The short stops at Running Eagle Falls and the shore of Two Medicine Lake provide a relaxing interlude in a leisure day dedicated to driving and sightseeing. 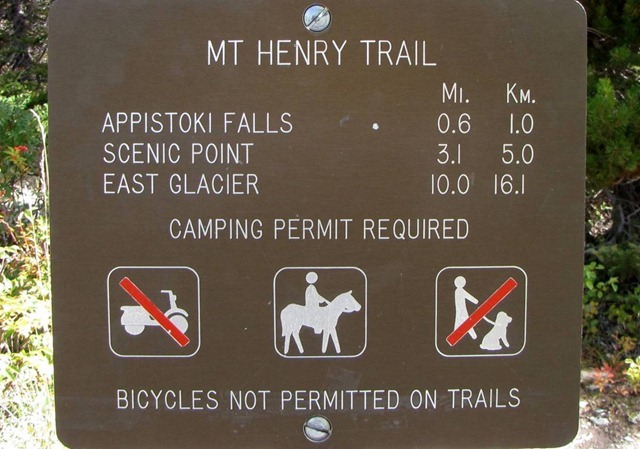 With intent to head out from Two Medicine for the short drive north to Cut Bank, the decision to investigate the gravel parking area a short distance from the lakefront discovers a trail-head sign which lists a short hike of only ⅝ of a mile (1.0 KM) to Appistoki Falls. What harm could that do? Glacier National Park trail signs do not provide information for elevation but the guide-book informs 260 ft (79 m). Child’s play. Why not, on this gorgeous day? The hike begins on the Mount Henry Trail. The hike is a pleasant u-shaped walk which gradually gains elevation through forest of sub-alpine spruce trees and lodge-pole pine above richly colored underbrush and tall grass. Appistoki Creek is surrounded on the east by 7,522 ft (2,293 M) Scenic Point, to the south by 8,847 ft. (2,697 M) Mount Henry with 8,164 ft (2,488 M) Appistoki Peak to the west. The short spur from the main trail leads to the top of a steep river gorge with Appistoki Falls in the near distance at the end of cascading rapids feeding beautiful aquamarine pools in the narrow slot canyon. Water flow is low and the falls are partially hidden by the rock cliff the falls navigate. The viewpoint is precarious on the edge of a steep canyon wall and the view is not particularly spectacular. Behind me, looking downstream, there is an excellent view of Rising Wolf Mountain. Rising Wolf was the name given to Hugh Monroe by the Piegan Blackfeet. Hugh was a native of Québec, Canada who, in 1814, at a very young age, became an employee of the Hudson’s Bay Company. Hugh Monroe lived among the Blackfeet, played an important role in the early development of Glacier National Park and may have been partially responsible for naming St. Mary Lake.